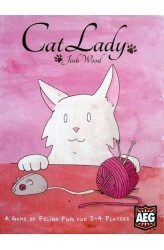 In Cat Lady, players are cat ladies, part of an elite group of people including Marie Antoinette and Ernest Hemingway. During the game, you and your fellow cat ladies will draft cards three at a time, collecting toys, food, catnip, costumes, and of course lovable cats. But watch out! Make sure you have enough food for all of your feline friends or your hungry cats will subtract points from your score. The player with the highest total victory points wins the game! https://youtu.be/zWhAlgA6gw8 .. 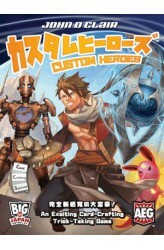 Custom Heroes is a card-crafting, climbing trick game in which plastic cards are added to sleeves in order to modify the cards already in those sleeves. Please note: Custom Heroes is shipped with a protective plastic film on each card which should be removed prior to play. Once removed the colors will be more vibrant and it will be easier to see cards in a stack inside a sleeve. The players attempt to win rounds by getting rid of their cards as quickly as possible using the classic climbing trick mechanic. e.g. If a player leads with three 4s then the next player must play three of a kind of equal or higher value. When all players pass, the last player to have played cards leads a new trick with whatever card or set of equal cards they want. Go out of cards first for first .. The Kingdom of Rolldovia is in turmoil. Her royal highness, the Queen, has decreed that there will be a new capital after the old one was sacked by hordes of barbarians and bandits from the south. As leaders of one of the country's influential noble families, players vie with each other to establish their provincial city as the best home for Rolldovia's new capital. You must choose your city's path in gaining the approval of all others in the kingdom. 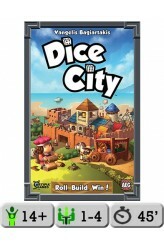 Dice City is a "dice-crafting" game in which the locations in your city act as the changing faces of your dice each turn. Use tactics and strategy to press your claim! You each have several ways to promote your city; create strong armies; construct wondrous buildings; or open up trade routes. The secret is to manage your city and i..
Progress! That's what these Dark Ages need, someone with a little get-up-and-go. 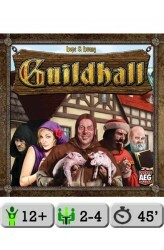 You've been a serf in this one-pig town long enough, and it's time to shake things up. You've opened a guildhall for like-minded professionals from all over Europe to work together, build their trades, and get some economic stability. Now if only everybody else didn't have the same idea... Well, you'll just have to do it faster than those other guys! Gather professionals into chapters, and use their combined might to reach for victory. Collect complete color sets of professions (all five colors of Trader, for instance), which you use to buy victory points (VP). The first player to gain 20 VP on her turn wins. In Guildhall, each profession grants you special abilities, and these abilities grow..
Love Letter Premium takes the familiar Love Letter game and enhances it in two different ways. First, the cards are supersized and much thicker than normal, the hearts that players claim are large and wooden, and the hard-sided box has a magnetic closure. Second, the game now plays with up to eight players thanks to the inclusion of an additional set of cards, such as the Assassin (0) which eliminates an opponent if that opponent forces you to reveal it and the Sycophant (4) who must be the target of a played card until it's covered on the next turn. 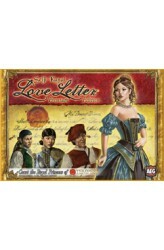 The rules for Love Letter Premium dictate which cards to use depending on the player count. 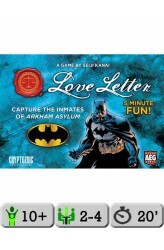 https://youtu.be/Mb20qwMAnCA ..
Love Letter: Batman is a game of risk, deduction, and luck for 2–4 players based on the original Love Letter game by Seiji Kanai. The deck consists mostly of criminals, with Joker being the most valuable card at #8, Harley Quinn at #7, and so on, with Robin showing up at #4 and Batman as #1, which is the guard in the original Love Letter. Your goal is either to hold — that is, have captured — the highest valued card at the end of the round or to be the final player active in the round. From a deck with only sixteen cards, each player starts with only one card in hand; one card is removed from play. On a turn, you draw one card, and play one card, using the power on that card to expose others and (possibly) knock them out of the round. 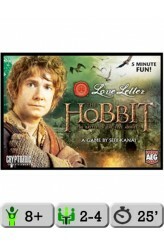 If you use Batman's ability to KO som..
Love Letter: The Hobbit – The Battle of the Five Armies is a game of risk, deduction, and luck for 2–4 players based on the original Love Letter game by Seiji Kanai. The deck consists of 17 cards, with the Arkenstone being valued #8, Bilbo Baggins #7, and so on down to The One Ring at #0. In each round, each player starts with only one card in hand; one card is removed from play. On a turn, you draw one card, and play one card, using the power on that card to expose others and (possibly) knock them out of the round. If you're the final player active in the round or the player with the highest card when the deck runs out, then you score a point. In LL: The Hobbit, The One Ring does nothing during play, but it counts as a #7 when the game ends, possibly leading to a tie should someone.. It is the 1920s, and the world is in a state of confusion following WWI. During this time, you and your friends find yourselves amongst mysterious events. You are surrounded by strange figures, letters with unreadable texts, as well as sudden appearances of being unknown. By relying on your connections, you set out to investigate these incidents. 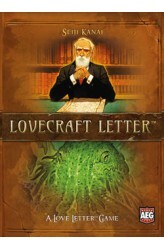 Unknown to you are the frightful truths that lie in wait ahead of you... Lovecraft Letter is a card game that combines the Love Letter system with the world of H.P. Lovecraft. In addition to the standard sixteen cards in the Love Letter game are new versions of the cards that include special "insanity" powers. If you have one of these cards in your discard pile, then you are insane (at least for the current round) a..
A curse has been placed on the Valley of Life. Hearing the spirits of nature cry out for aid, clans of druids have arrived, determined to use their blessings to heal the land and rescue the spirits. It will require courage and also caution, as the curse can overwhelm the careless who wield too much power. 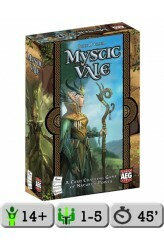 In Mystic Vale, 2 to 4 players take on the role of druidic clans trying to cleanse the curse upon the land. Each turn, you play cards into your field to gain powerful advancements and useful vale cards. Use your power wisely, or decay will end your turn prematurely. Score the most victory points to win the game! Mystic Vale uses the innovative "Card Crafting System", which lets you not only build your deck, but build the individual cards in your deck, customizing each..
A Card Crafting Game of Nature’s Power! The campaign to restore Gaia's realm rages on and other druidic clans combating the curse have joined the ranks. And it’s not just druids who have heeded the call; other creatures have joined the fight, eager for a day when all are free from the accursed blight. 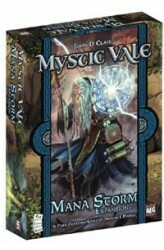 The Mana Storm expansion adds new advancement and vale cards to the base Mystic Vale game, giving players more card crafting options and exciting new possibilities for combos. New leader cards grant abilities that can be upgraded to become even more powerful! Amulets feature unique effects and greater variety over regular mana tokens. .. 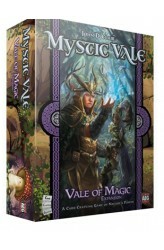 Mystic Vale: Vale of Magic introduces 54 new advancement cards and 18 vale cards to the Mystic Vale base game, expanding player’s options and opening up new crafting combinations. This expansion is designed to be mixed straight into the base game, introduces effects that trigger “when bought” on some of the vale cards, and has a slight emphasis on Guardian power on the card advancements. ..
You are the mayor of a tiny town in the forest in which the smaller creatures of the woods have created a civilization hidden away from predators. This new land is small and the resources are scarce, so you take what you can get and never say no to building materials. 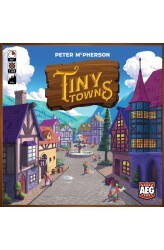 Cleverly plan and construct a thriving town, and don't let it fill up with wasted resources! Whoever builds the most prosperous tiny town wins! In Tiny Towns, your town is represented by a 4x4 grid on which you will place resource cubes in specific layouts to construct buildings. Each building scores victory points (VPs) in a unique way. When no player can place any more resources or construct any buildings, the game ends, and any squares without a building are worth -1 VP. The player with the most VP wins! ..